As someone getting “up there” in age (let’s just say over 30, younger than 50) I have been looking for ways to preserve and maintain my youthfulness without having the shell out oodles of money or go to extremes. While I am not against plastic surgery, I’d rather try other methods first before going to the doctor’s office. I saw this product on QVC. I have a love/hate relationship with QVC because I always seem to be making Easy Pays to them… It’s liking having a second child that I dole out a monthly allowance to, but that’s a whole ‘nother post in of itself. Back to the NuFACE Trinity… I bought mine in a combo with the Gel Primer and ELE (Effective Eye and Lip Treatment) Attachment. This device uses microcurrent to improve facial contours and skintone. The first time I used it I immediately felt that my skin on my neck and face was more toned and taut. Nothing drastic, but I was a bit surprised that I noticed a difference WITH THE FIRST USE! I used the device a few times over the next week (with the standard and ELE attachments) and really started to see a difference… my eyes were lifted, my neck had less slack, and my cheekbones were looking better and better. I also noticed my skintone was more even. The best results were seen right after a treatment, with more permanent changes over time. The included booklet provides instructions on how to use both attachments. Each treatment can be tailored to your schedule and availability, whether it’s just a few minutes or a half hour. A standard session treating the entire face and neck will take approximately 8-10 mins. I have now been using the device for over 6 months and I won’t be without it. 1. You must use the Gel Primer or some sort of conduit for the electric current and to provide “slip” for the nodes to glide on. Apply the gel as you go, only to the area you are working on, to keep the gel from drying out. If you do not have enough gel you will feel the tingle from the current. Keep in mind you can adjust the amount of current by changing the setting. 2. If the idea of washing off the Gel Primer does not appeal to you, use pure aloe gel. Be sure it doesn’t have other additives and colorants (i.e. – it should not be bright green)! I use this one with good results: Fruit Of the Earth Aloe Vera Gel It doesn’t break me out and it absorbs nicely into my combo/oily skin. I can even perform a treatment in the morning after my shower before I apply my skincare and makeup. I would love for NuFACE to come out with a skin treatment gel that doesn’t require removal afterwards. 3. If the gel dries out spritz with water to refresh. I use an Evian mister. 4. Do some sort of weight training in conjunction with this device. Whether it’s weight lifting or weight-bearing exercises, helping to tone muscles in other parts of the body will help with the muscles in the face as well. Squat challenge anyone?! 5. Use the device at least 3 times a week, but more often is better. Ideally use should be 5 times a week. 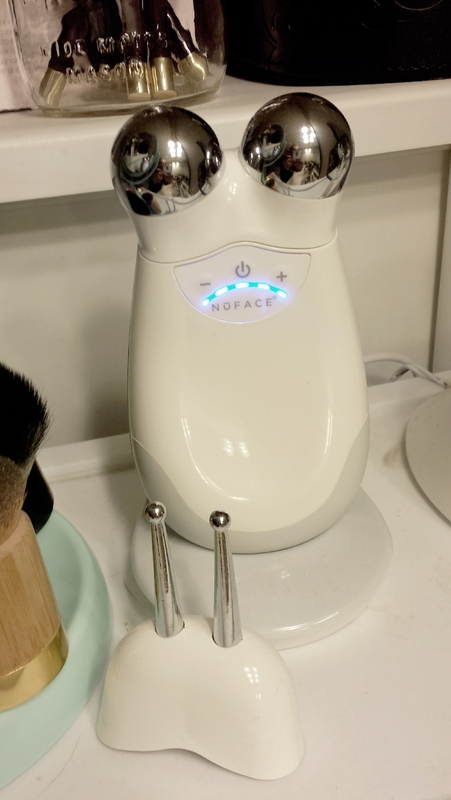 Do I use the NuFACE 5 times each week… no. Should I use it more? Yes! Sometimes I have to remind myself that even 2-3 mins going over my “trouble spots” is better than nothing. 6. Remember to use the device before any big events… you will see the best results just after a treatment. It’s nice to take a chance on a product and be surprised at how well it works. I love it so much I even thought about getting the Mini version for travel or keep on-hand for events, etc. Tags: beauty, gadget, nuface, qvc, skincare, trinity, wrinkle. Bookmark the permalink.